In the previous blog post I introduced you to the common JS API, and you used the method 'setVariableValue' to populate a variable defined in the Captivate project. That value was a random number generated in the JS window, using the Math.random() and the Math.floor methods. The values were integers, between fixed numbers 10 (included) and 100 (not included). In this second article you'll learn to know a new method 'getVariableValue' from the JS API, which lets you transfer a value to JS. We started with the mathematical operation 'Sum', now we'll switch to 'Subtractions' needing again the command 'Expression'. Because CP cannot handle well negative values, we'll have to take care of that as well. The progress bar introduced with the Sum exercises, will be continued. You'll see that it is possible to change the state of an object, displayed for the rest of the project, from a slide where that object is not inserted. Subtraction will be with two terms, always integers. Whereas in the Sum slide I decided that all terms would have to be between 10 and 100, on this slide the user will be able to choose a Maximum number, and if he wants a Minimum number. The minimum number has already a default value of 10, which can be changed by the user, the maximum number is empty. The Max value needs to be bigger than the Min value, if that is not the case, the Max value will automatically be set to 'Min + 200'. The same sticky figure (with states) and OK button (with state New) are used as described in the previous post for the Sum slide. 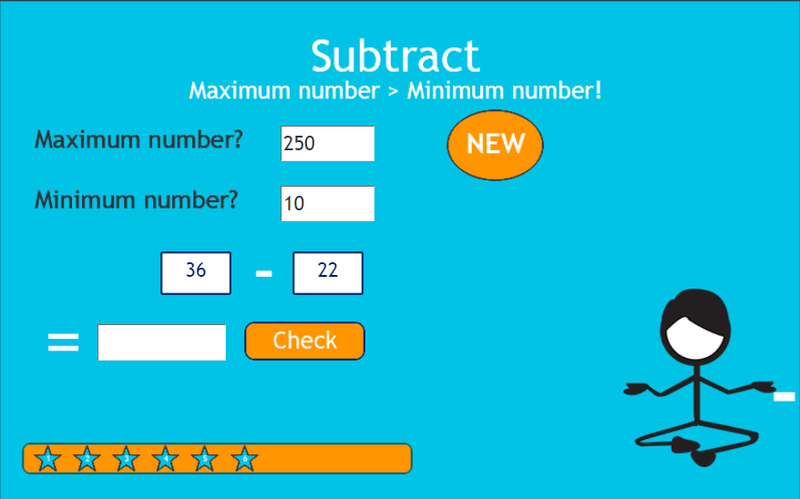 This Subtract slide can only be visited when 5 correct Sum exercises have been done, hence the 5 stars on the progress bar are in place on entering this slide. 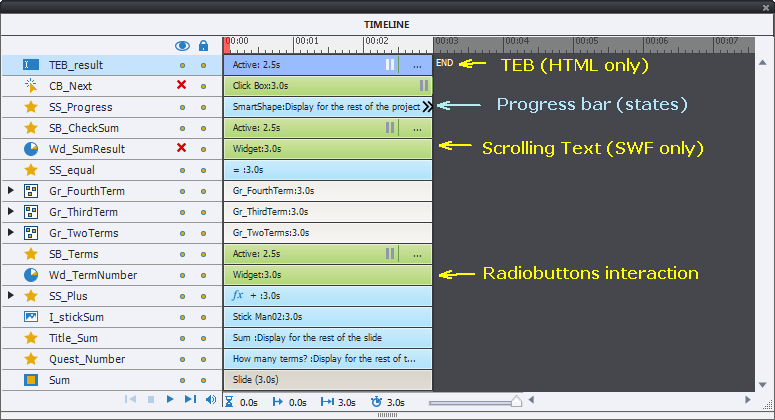 The progress bar is set to display for the rest of the project, and you can change the state (to 6 or more stars) from this Subtract slide, although the progress bar is not visible in the Timeline. New stars can be added after a correct subtract exercise, and after 10 stars, the Next scenario is executed (same as on Sum slide). Progress bar, which has been displayed for the rest of the project. To make the next state of the sticky figure interactive, it is covered by a Click box CB_Next2. v_result: will store the result value typed in by the user in TEB_result, has to be reset as well. v_check: will be calculated and used to validate the result given by the learner. xprefTEBUpdateFromVariable: for HTML output, one of the CpExtra variables. When assigning the value 1 to this variable (with CpExtra widget loaded either in the file, or headless) it is possible to change the associated variable of a TEB by an action, and it will be reflected immediately in the TEB. I used this to clear TEB_Result. Shared actions were not possible. 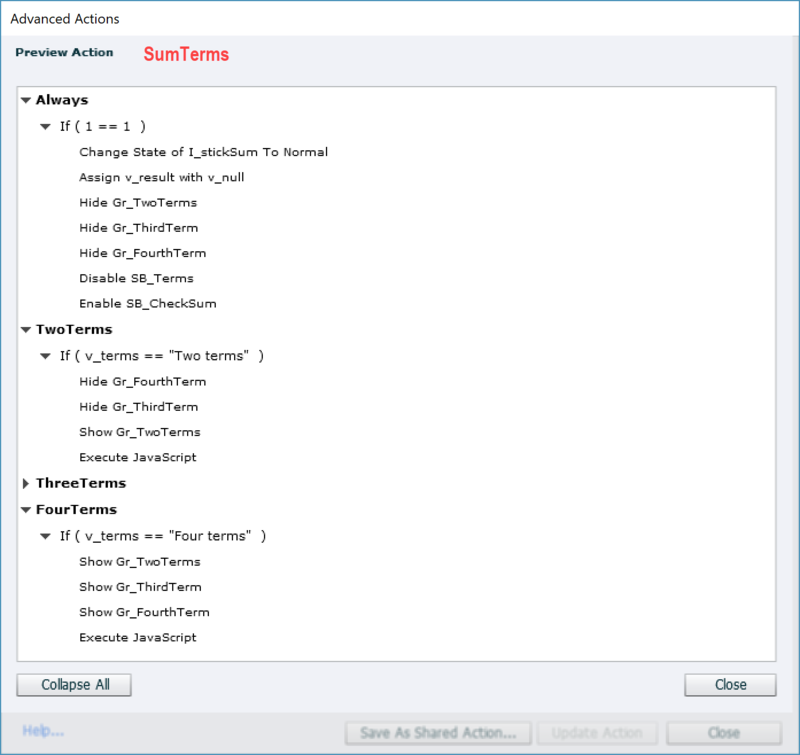 One Standard advanced action was needed (to reset vars) and two Conditional actions. "CheckCorrect" will compare the values stored in v_max en v_min. If the maximum value is not exceeding the minimum value, the maximum value will be calculated by adding 200 to the minimum value. "RandomNum" will generate two random numbers and store them in the variables v_three and v_four. Reason is that the last decision will have to put the largest number into v_one and the smallest in v_two. This could have been checked in the JS script window as well, but I wanted to keep the JS as simple as possible and checked with the last decision. "CheckMax" compares the values in v_three and v_four. The largest value will be assigned to v_one, the other to v_two. This decision also calculates the result of the subtraction to be stored in the variable v_check (will be used to check the user's entry). The first decision 'Checker', will check the entered value (v_result) with the correct value (v_check). It is the only decision with a Then and Else part. For correct answer, the state of the sticky character is changed, the counter (v_progress) is incremented, the state of the button SB_Number is changed to another state and enabled again, while the button SB_CheckSubtract is disabled. For an incorrect answer, the counter is not incremented, and the sticky character is changed to another state. 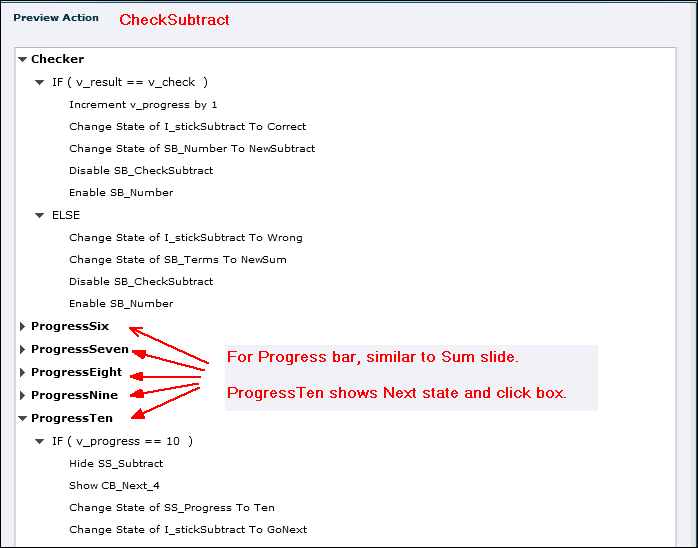 The 5 other decisions 'ProgressXxxx' check the value of v_counter and show the appropriate state for the progress bar. The last decision 'ProgressTen' will also change the sticky Character to its state GoNext and enable the click box to proceed to the next slide (subject of the next blog post, with Multiply exercises). Math.floor() which will convert a decimal number to an integer by rounding it down (cutting off the decimals). You are already familiar with SetVariableValue to store the result of first in v_three - Captivate variable, and second in v_four. You earned a second star, soon a third part will be ready, up to multiplications and bit more of randomness. How to use Adobe Captivate to create a course for simple calculations, has been popping up on the forums several times. You can use Text Entry Boxes, MCQ's to reach that goal, but that is pretty limiting. Some examples can be found in this older blog post where the real goal was to have the score being linked to the attempts. This article will focus on the Sum operator, and introduce JS to make it possible to generate random numbers. You'll also see how to assign that generated number to a Captivate variable with the function setVariableValue from the API. That will allow to use the same slide for several sum questions. I will use the Multi-state object feature of Captivate 9 several times as well. In the next parts you'll also learn about retrieving a Captivate variable value with getVariableValue, how to format a number to specific number of decimals, how to avoid dividing by 0 (zero). 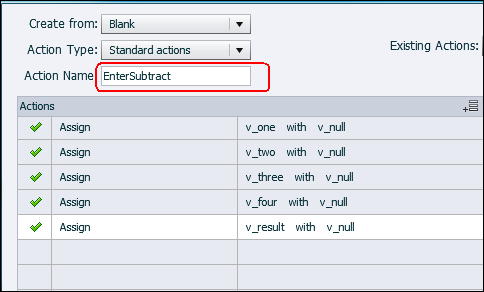 User will be allowed to choose for sums consisting of 2 up to 4 terms. The number of terms can be changed after completion of one exercise. For a correct answer, the stick figure will change to another state, and a star will be added to the progress bar (also a multi-state object). 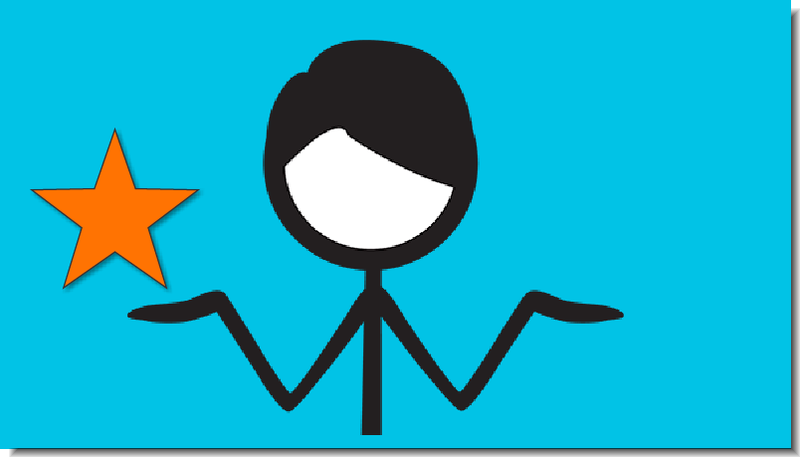 For an incorrect answer the stick figure also changes to a state but no star will be ended to the progress bar. 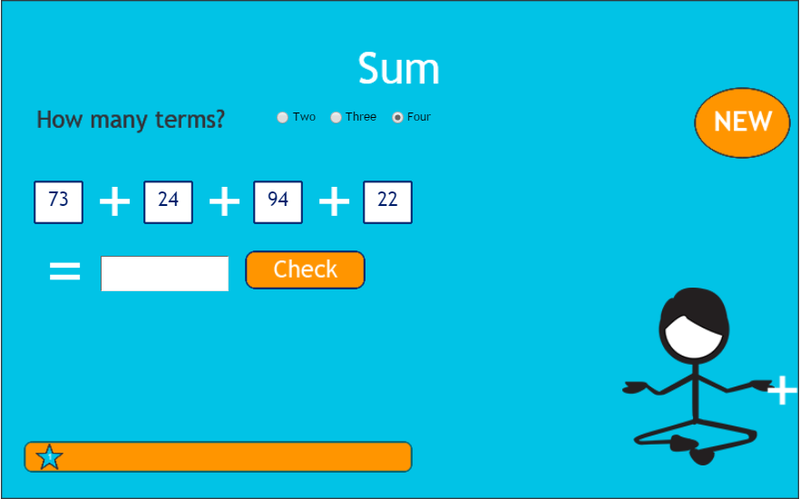 After completion of 5 correct sums, the stick figure will change to a Next button. The user could still add more questions, but no more 'stars' will be added to the progress bar. Radio buttons - works perfectly for SWF output but formatting is not preserved for HTML output; labeled "Wd_TermNumber"
Text Entry Box, labeled "TEB_result" combined with the CpExtra widget and a specific command variable for HTML output. 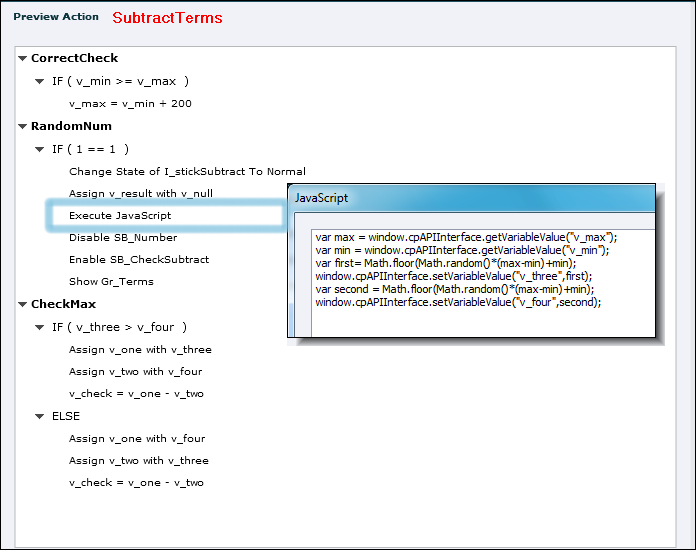 Since there is a bug in Captivate 9, which prevents using a TEB multiple times on a slide, I used a workaround. The default Submit button was deleted. It was replaced by a custom shape button (SB_CheckSum in the timeline) to trigger an advanced action. In this case an easy workaround, since I used that same shape button for the Scrolling Text Interaction for SWF output. The associated variable for the TEB is the same as for the Scrolling Text Interaction (v_result). Nothing had to be changed to the advanced action 'CheckSum' when replacing the Scrolling Text Interaction by a TEB. xprefTEBUpdateFromVariable: only for HTML output, one of the CpExtra variables. When assigning the value 1 to this variable (with CpExtra widget loaded either in the file, or headless) it is possible to change the associated variable of a TEB by an action, and it will be reflected immediately in the TEB. I used this to clear the result when defining a new sum. This conditional action has 4 decisions, the first 'Always' is a mimicked standard action (will always be executed), prepares for a new sum by clearing the result and the terms. It also resets the state of the sticky character. This conditional action has 7 decisions. The first decision 'Always' will calculate the sum. It doesn't matter that it always sums four terms, since the lacking terms are empty. The second decision 'Checker', will check the entered value (v_result) with the correct value (v_check). It is the only decision with a Then and Else part. For correct answer, the state of the sticky character is changed, the counter (v_progress) is incremented, the state of the button SB_Terms is changed to another state and enabled again, while the button SB_CheckSum is disabled. For an incorrect answer, the counter is not incremented, and the sticky character is changed to another state. 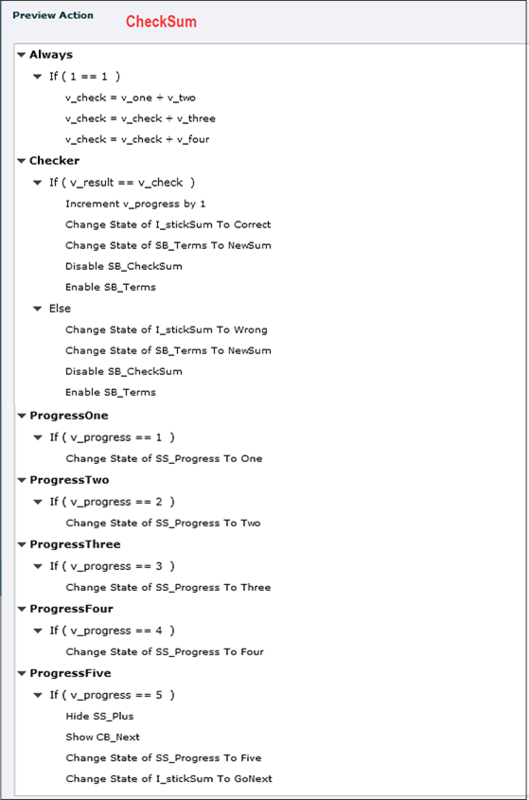 The 5 other decisions 'ProgressXxxx' check the value of v_progress and show the appropriate state for the progress bar. 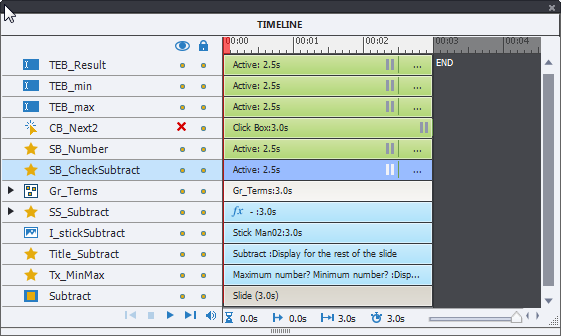 The last decision 'ProgressFive' will also change the sticky Character to its state GoNext and enable the click box to proceed to the next slide (subject of the next blog post, with Subtract exercises). The JS method Math.random() generates a decimal number between 0 (included) and 1 (not included). The multiplication Math.random()*(100-10) will result in a random (decimal) number between 0 (included) and 90 (not included). The sum Math.random()*(100-10) + 10 will result in a random (decimal) number between 10 (included) and 100 (not included). The JS method Math.floor(e) will cut off the decimals of the argument e, round iit down to the nearest integer. As a result the full expression used in the JS window Math.floor(Math.random()*(100-10) + 10) will result in an integer between 10 (included) and 99 (included).